No matter how long you’ve been in business or had a website there is always potential to benefit from search engine optimization (SEO). It might seem overwhelming at first, but it’s not something you need a master’s degree to figure out. Ideally, the principle is to capitalize on 80 percent of benefits with only 20 percent of the total work. Well, how do you do it? Take a look at these options. Never underestimate the benefits you can derive from using relevant keywords which is something all Atlanta website companies would tell you. Your goal is to improve your search engine results and keep your customer’s attention once they arrive. Optimize your pages to focus on their existing rank and how much volume it holds for searching. Keep these ideas in your mind to get your creative juices flowing. Utilize keyword research tools such as browser extensions, the Google ads keywords tool, and the Google search engine itself. Google offers keyword suggestions along the bottom of the page, which can give you some insight into what your competition is using to drive traffic. Expand your selection to include variations of keywords and specific services that your business offers. Always produce content that is easy for your visitors to read and structured well. A giant blob of text is unappealing. Add headers, bullets, and images to your site and posts to capture and keep traffic on your site. Avoid overstuffing your posts with keywords so it doesn’t sound like your content is computer generated. 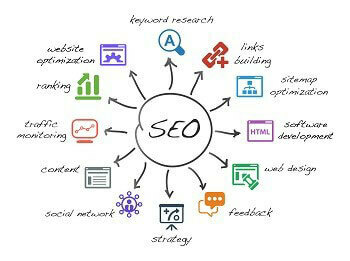 Search engine optimization can be a difficult task, but it’s not impossible to learn.